With more trail time than other tours, you can really immerse yourself in the desert experience. Meet your air-conditioned vehicle at your hotel for the 30-minute ride to the desert town of Jean, where the tour takes place. Get a thorough safety briefing from your experienced adventure guides, then put on your goggles, gloves and helmet and climb aboard your RZR. These off-road vehicles are souped-up golf carts with a boost of horsepower, and are equipped with a cage structure that surrounds the passengers on all sides. Opt to drive your own 2-seat Polaris RZR 900 or choose to join up with a professional driver so you can sit back and enjoy the ride. 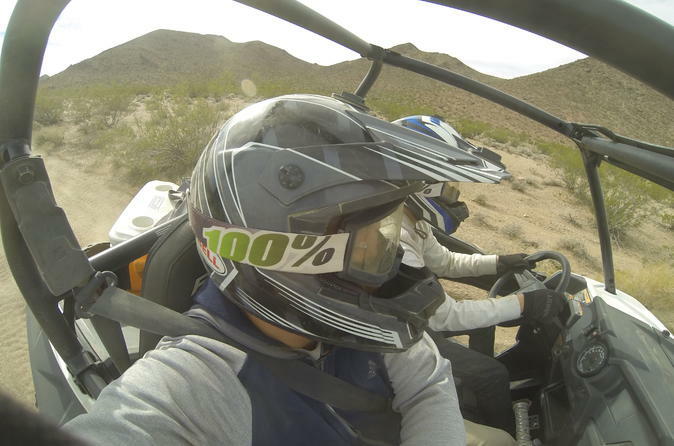 Set off on the longest RZR tour available in Las Vegas, covering anywhere from 20 to 50 miles (32 to 80 kilometers) of rugged desert terrain. Maneuver through trails, ride up to mountain overlooks and zoom around legendary off-road racetracks. The morning tour stops for a short break at Buffalo Bill's Hotel and Casino in Primm, Nevada, on the California-Nevada state line before returning to the RZR base. The afternoon tours are slightly shorter, as they do not stop in Primm. At the end of your rugged desert adventure, enjoy transportation back to Las Vegas and drop-off at your hotel. Please note: Special offer is NOT valid for single riders. By booking this special offer you will only receive one (1) shared 2-seater RZR for two (2) passengers. KC was right on time to pick us up and gave us a nice rundown of the town and the sights. The equipment was brand new and in good condition. The views from the mountaintop stop were beautiful. Excellent company and overall experience. KC our tour guide was very friendly and promptly on time. The RZR’s are awesome and easy to drive. A lot of distance covered with an incredible view on top of a 5,000 ft mountain! The guys were professional and a lot of fun. Answered all questions that we had. Would definitely do it again!!! 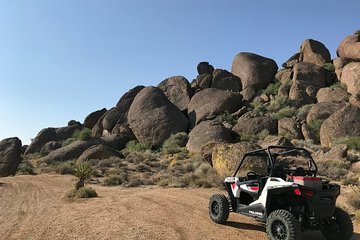 Great morning out on the desert! Guide (Robbie I think) kept up the pace enough to make it fun for the more experienced drivers and yet watched out that everyone was keeping up with the group. Nice stop at an outlet mall/food court for a quick lunch. Definitely gave you everything they promise in the description of the tour! Trail is bumpy but manageable. Definitely recommend this tour! We totally enjoyed the RzR adventure. Our guide was Kyle, he did a good job explaining everything so you knew what to expect in all the different kinds of terrain. We had a Blast! Casey was also helpful and fun. He did the quads on the same trip. This was an excellent tour. The crew, equipment and journey were top of the line. I highly recommend this tour for families, friends and colleagues travelling to Vegas and looking for fun outside of the Stip. Tyrone was beyond personable and made the event an excellent experience. 35 to 40 miles of pure excitement. The guides are great and the customer service is unmatched. Cant wait to come back and do it again . Dont use any other tour. KC is the coolest guide ever. I can’t say enough good things about this adventure. From the time they picked us up to the time they dropped us off, we were entertained and well taken care of. They provided us with fun facts all along our journey along with plenty of cold water. They also did the little things that made all the difference like kept baby wipes and towels in a cooler to cool you down. These guys were knowledgeable and humorous and their personalities made our experience that much better. The equipment was well kept and the tour through the desert was well planned. You have to do this tour!